Every register needs a We Card calendar! 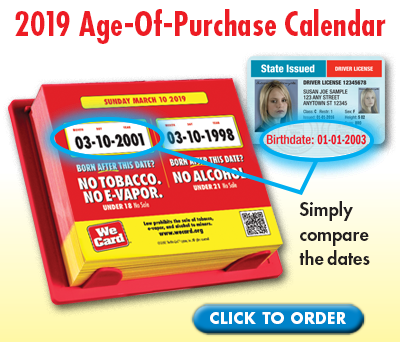 Not only does the calendar assist frontline employees in calculating the correct age for a legal tobacco or vaping product sale, it also serves as a daily reminder to employees that they need to ask for and check IDs for customers who are Under 27. It serves as a reminder not just visually but by the daily act of removing the page as the days turn. 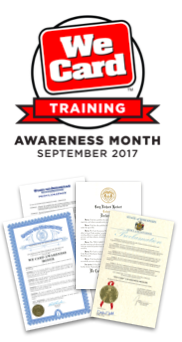 And interestingly, retailers find that this job aide is one of the single most valuable tools in keeping the idea of carding on employees' minds because with the multiple responsibilities retailers have, a friendly and useful daily reminder is vital. The calendar "does the math" for us so we won't make a mistake. It's so much easier to use [the calendar] when carding customers, especially when it's busy. It tells customers what we're going to do. Some kids see the calendar and hesitate to try to buy [age restricted products] from our store. We use the age prompt on our cash register once the product is scanned, but we still have the calendar on the counter facing the customer. We like a calendar nearby to show us today's date and what the ID date should be. And here at We Card, now is the time to order your We Card calendar and other signage and in-store materials. Why? I can give you 150,000 reasons. That's the approximate annual number of compliance checks FDA conducts on America's tobacco and vaping product retailers. FDA is checking to see if you're carding "under 27" year old customers (each and every time), verifying a customer's age AND denying the sale to minors. Didn't order your calendar yet or want to see the We Card 2019 Catalog? You can download one here or view all We Card items online and order online at www.wecard.org. And thanks for your responsible retailing of age-restricted products.